The main benefit is that influencers humanize a brand and capture the personality behind the logo. Additionally, influencers raise brand awareness and engagement by giving companies access to an audience they may not otherwise have through a trusted and credible source. It is decentralized which means it is more integrated with the rest of the work the teams are doing vs. it being the burden of a standalone organization to negotiate with and get mindshare. We at Adobe pride ourselves on cultivating and nurturing long term relationships with our influencers. We look at it as dating with an eye towards long term commitment which means we are always looking to establish a “give to get” exchange where all parties come out ahead. With an always on approach like this, it’s easier to match the right influencers with the right campaigns as they get launched. That said, there are certain influencers, celebrity influencers for the most part, who would rather do campaign focused work with us and aren’t looking for anything long term and we are just fine with that approach as well on a case by case basis. My main tip is to make the upfront investment to ensure the influencer is the right cultural fit for your brand. Make sure they are already talking about the topics that matter to you, doing work that is in line with your business, sharing your company values, demonstrating expertise in an area that would help you move your work forward, etc. Ultimately, ask yourself pretty much the same questions as you would if you were going to hire this individual because at the end of the day they will be representing your brand. The way to figure all this out is by following their online presence and asking for referrals in addition to having a direct and frank discussion with the influencer themselves. With the number of influencers available to choose from there’s no need to spend time converting someone into something they aren’t. Much like with dating, you are setting yourself up for disappointment by assuming you’ll be the one to change them. Play to people’s natural strengths and be clear about who you are as a brand so that they can also make an informed decision on cultural fit. Avoid the temptation to put only your best foot forward without exposing your challenges and objectives you are looking to reach. Many B2B companies focus on their influencer partnerships to raise brand awareness and engagement. 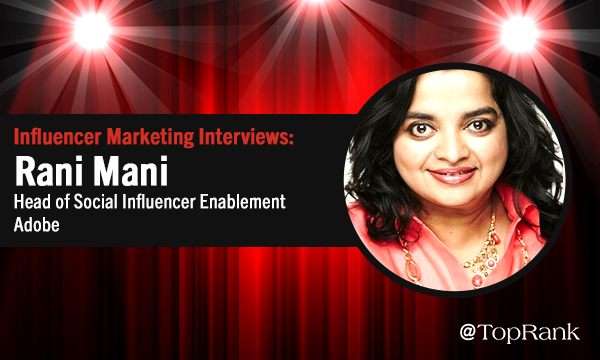 How does working with influencers in B2B help drive leads, sales and revenue? Having influencer testimonials and endorsements on product pages is a great way to drive leads and sales since most buyers turn to online advice for their purchase decisions. Also, influencers amplifying content that resonates with their audience while driving traffic back to your website is another successful tactic. Are there specific B2B influencers that you keep going back to because they are so amazing? because they have expertise and authority on topics that Adobe cares about. In addition, they are amazing content creators who are thought leaders in their space and are incredibly humble and reliable to work with. Open, honest, regular communication about what success looks like to each party is vital to a win-win relationship. It has to be based on mutual trust and respect, not to mention a genuine interest in the other party’s success. What are you most influential about personally? I am the most influential in the areas of leadership and personal development. My life’s work is to help people fulfill their dreams and be the best version of themselves. If you would like to learn about what actually works in B2B influencer marketing, be sure to check out our panel next week at MarketingProfs B2B Forum November 15th from 11:15am-12:00pm at the San Francisco Marriott Marquis featuring Amisha Gandhi from SAP Ariba, Dr Konstanze Alex from Dell, and Luciana Moran from Dun & Bradstreet.